When a storm or other major event looms on the horizon, utility and communications companies turn to mutual aid organizations for fast, urgent, and widespread support. These organizations empower networks to respond quickly to the unpredictable nature of weather, while also recognizing that any one company may have limited ability to provide resources at a given point in time. How do they trigger such support? They must pick up the phone, or send out a bunch of emails. “If there is a widespread outage, [they] can call or email their counterparts in other utilities to ask for help,” explains an article in the American Public Power Association’s Public Power Magazine. During a critical time when every moment counts toward ensuring sufficient preparation, valuable time must be spent on manually communicating with dozens—or hundreds—of other companies to request help and manage replies. Even when this process is well organized, the coordination can be time-consuming and complex. Utility companies and their customers would benefit from an easy and fast method to request aid in emergency situations, while simultaneously tracking responses. In the past, these agreements were born out of a shared interest in self-preservation. Utilities recognized that in situations of massive damage and outages, they need each other to get back online quickly. Mutual aid agreements have since become an essential part of the electric power industry’s service restoration process and contingency planning. Companies impacted by a major outage event can increase the size of their workforce by “borrowing” restoration workers from other companies. When called upon, a company will send skilled restoration workers—both company employees and contractors—along with specialized equipment to help with the restitution efforts of a fellow company. In the past, utilities called on friends in nearby utilities for help recovering from storm damage. 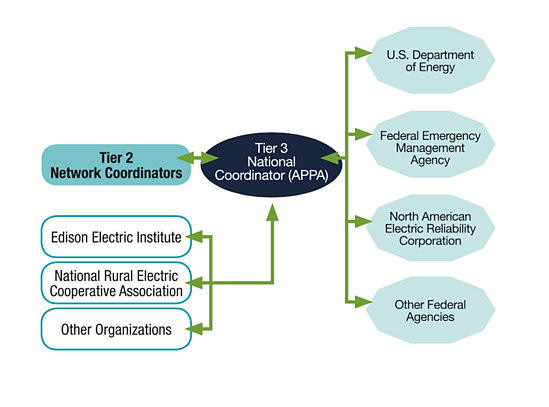 Today, many mutual aid organizations exist that cross utility ownership and may be composed of investor-owned utilities, electric cooperatives, and/or municipally-owned power providers. Edison Electric Institute (EEI): This association represents all U.S. investor-owned electric companies (IOUs), directly and indirectly employing more than one million workers. EEI’s mutual assistance program is a voluntary partnership that provides a formal, yet flexible, process for electric companies to request support. American Public Power Association: This organization represents more than 2,000 not-for-profit, community-owned electric utilities. It is a multifaceted mutual aid program that ensures a coordinated response with state and federal government officials. Municipal utilities and electric cooperatives also have their own mutual aid programs that provide restoration support to participating utilities. 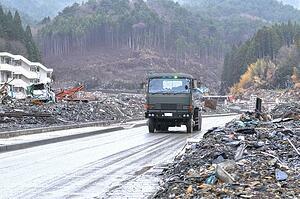 Many mutual aid organizations are divided into regional groups for easy response within close proximity. During major outage incidents, these organizations must coordinate. The chart below provides a simple representation of some of the key groups that must work together to ensure a smooth and sufficient response. During the hours or days leading up to a major event, companies facing wide-scale damage and an unknown future must race against the clock to guarantee they have enough help in restoring power service. Although mutual aid organizations are a keystone of the industry’s response to outage, the manual and extensive nature of this process often causes slower response times and higher costs. To streamline and support the complexity of mutual aid agreements, a shared, centralized asset database can be used to send out a request to all companies and organizations within an identified aid network with the single push of a button. They can communicate specific needs, track available support, and coordinate efforts among all parties within a single format that can be easily accessed by all and automatically updated in real-time. In the next post, we will dive in to how a shared, centralized asset database can help mutual aid agreements function more smoothly and with less complexity.